Vegetarian pasta e fagioli, or Italian pasta with beans, is a great high-protein pasta recipe for vegetarians and vegans (or Italians!). 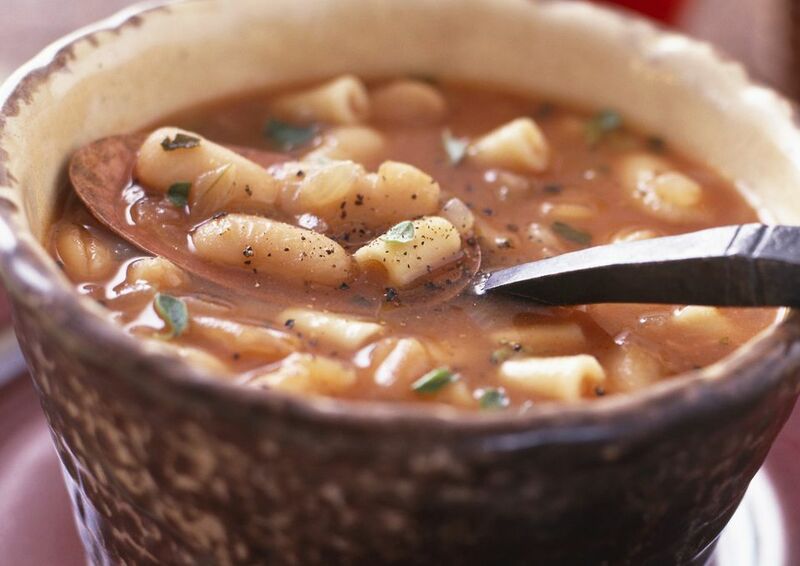 Pasta fagioli is made from small pasta (use little shells, bow ties, or even macaroni elbows) and white beans cooked in an Italian-seasoned tomato sauce with plenty of garlic, fresh basil, oregano and lots of paprika for extra flavor. I love this dish, because I absolutely love loading up on carbs (yum!) but the white beans, tomato sauce and fresh herbs temper the carbs, adding a protein boost. This pasta fagioli recipe is made with great northern beans for plenty of healthy fiber and protein. To make your pasta fagioli even higher in protein, use a whole wheat pasta. As is, this recipe is both vegetarian and completely vegan (and it would be gluten-free if you used a gluten-free pasta), but you could top it off with some Parmesan cheese if you're not eating vegan, or nutritional yeast, if you are. Cook the pasta in the water with 1 teaspoon of salt. Turn off the heat and drain almost all the water, reserving about 1/4 to 1/3 cup of the cooking water, then add the beans. In a separate skillet, sautee the diced onions, minced garlic, fresh chopped basil, oregano and remaining 1/2 teaspoon of salt and pepper for 3 to 5 minutes, until the onions are soft. Add the onions and spices to the beans and pasta pot and place over low heat. As the mixture is heating over low heat, add the paprika and tomato sauce and stir until well blended and heated through. You can add a little bit more liquid, if you prefer a "soupier" dish, or heat it a little bit longer to cook off some more moisture if you find it too liquidy. Serve your vegetarian pasta fagioli hot and top it off with some Parmesan cheese or nutritional yeast to keep it vegan. Make it a full meal by serving alongside a side green salad and some homemade garlic bread. And the wine? A medium-bodied red, such as a Pinot Noir or a Chianti, preferably an Italian, of course!